Roberto A Mamani, Juri Chinchilla, Babisu Kourtis. Matthew Sutton, Chris Chamberlain, Angelina Benedetti. Lisa LeBlanc, Tony Perna, Oliver Castaneda. Danielle Ellison, Sanna Umemoto, Achilleas Kokkinakis. Norvien Basio, Hanie Mohd, Benjamin Glendenning. Mick and Matt Glebe metal sketch . Pictures cannot do justice to the quality of these cards when you actually have them in your hand . For the record, I got packs 466-480. I still haven't sorted out a new location to post my sketches so I can display them here yet but I think I will have to investigate http://www.sketchcollectors.com which seems to be the site you are using. These are all outstanding! No one was home when they tried to deliver mine today tomorrow will be a big day! I love how much detail all the artists put into their work. The Nott (night) has a stars background, Ostara (Easter) has hares/rabbits etc. 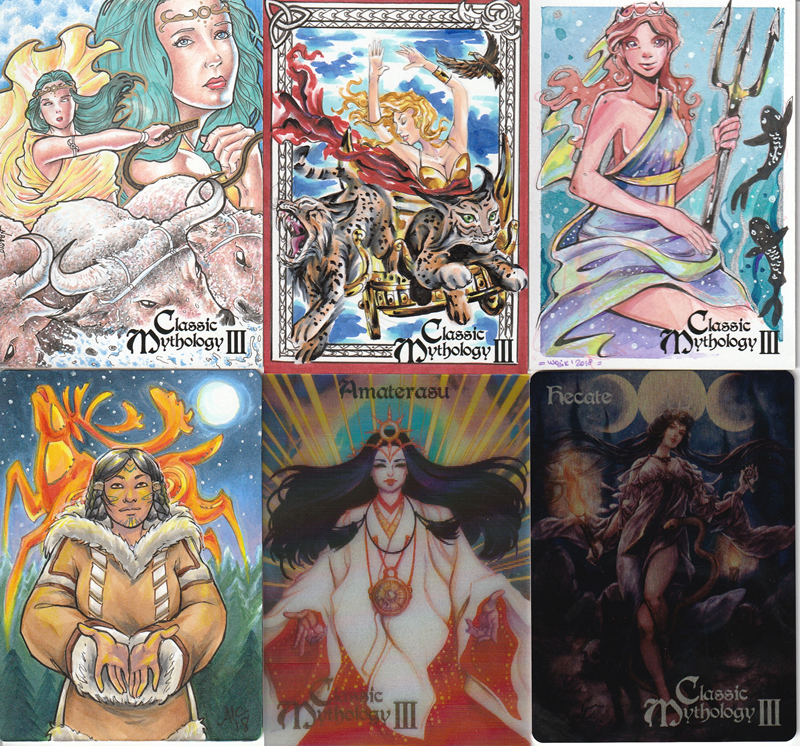 My plan is to keep or trade for one sketch from each of the seven mythologies, trying to get a goddess of night, sky, weather, wisdom, music or healing. 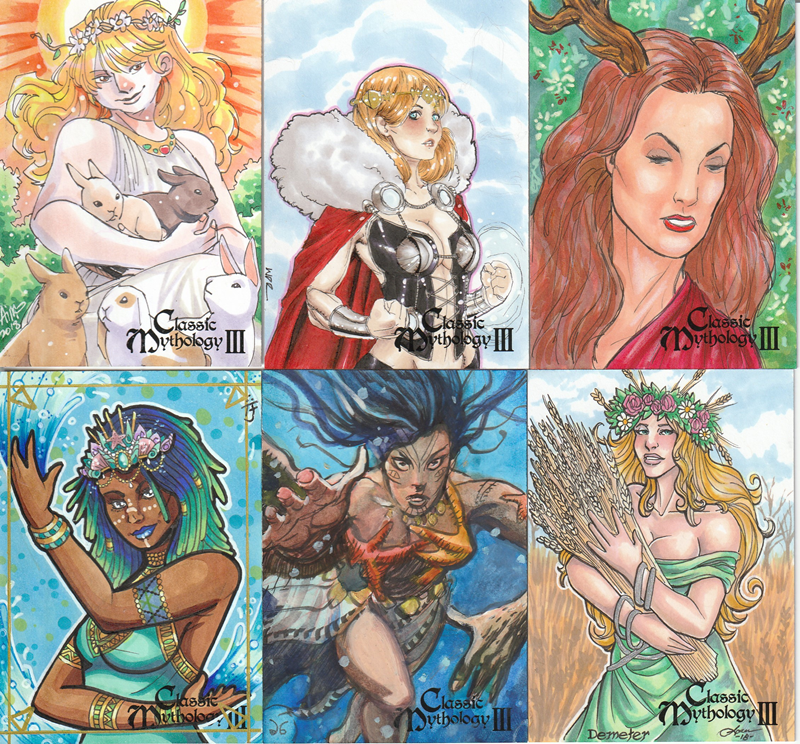 It's an odd mix, but most of the goddesses seemed to be stuck with fertility. Weather and sky was too narrow (almost all male deities!). So, from my hits, I am keeping Wojik (Greek, new artist to me, not in theme), Glendenning (Norse night), Basio (Norse, new artist to me), McDonnell (Egyptian truth and balance), Catris (African, new artist, not in theme), Anderson (Celtic healing), Clark Anderson (Native American, metal sketch, not in theme). All others (Ahmed, Rice, Brereton, Bobbitt, Arteaga, Braojos, Gransaull, Kokkinakis) are available. I don't have a Japanese sketch in my hits, so a nice Benzaiten by an artist I don't have would be top of my wants list. 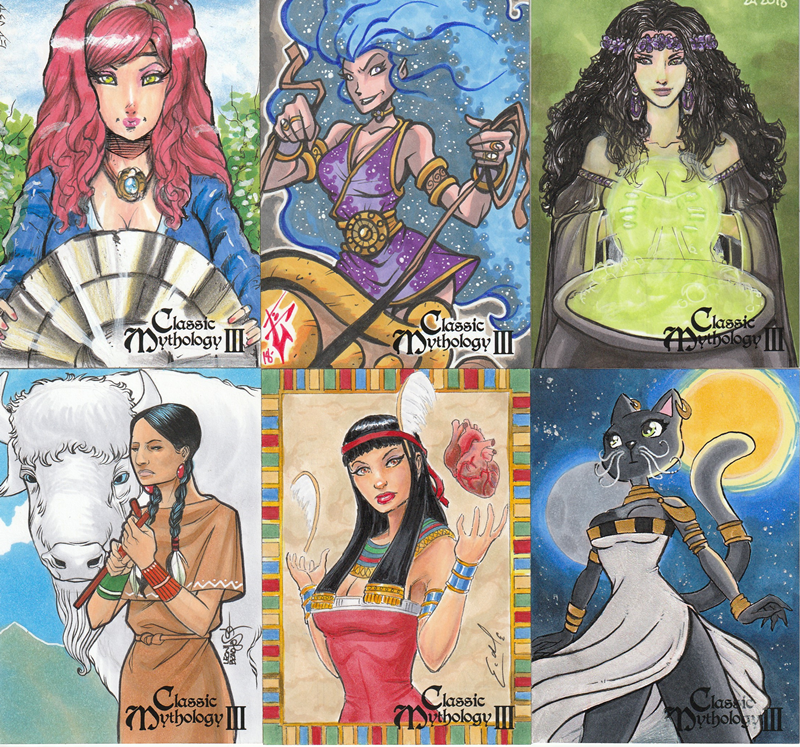 I am also willing to consider trading the Wojik, Basio or Catris for a different sketch but likely only for the same artist, and possibly the McDonnell for a different artist since I have quite a few of his in other sets. My first AP for this set, a wonderful Nyx the greek goddess of the night by Huy Truong. Pajamas just out of shot . My next AP, this one a floaty Selene from Loren Bobbitt . Last AP unless I win the lottery . Circe by Arwenn Necker who did a great job with my request for a fox as well as the background detail.